A sharp slide in the value of sterling has piled more pressure on the beef trade this week. The euro was trading at 90p sterling yesterday as the pound slipped to a three-month low against the European currency on the back of the mounting political chaos in Westminster regarding Brexit. While factory quotes were generally unchanged yesterday, industry sources accepted that the latest drop in sterling is bad news for an already weakened beef trade. The decision of British prime minister Theresa May to pull the Commons vote on the Brexit deal hammered out with the EU prompted yesterday’s fall in sterling, and could herald further sell-offs of the currency. Market analysts fear that sterling’s weakness could hit an already fragile beef trade in Britain, with supermarkets struggling to maintain meat sales. Recent figures from Kantar show that beef sales in Britain declined by 4.6pc in the 12-week period up to October 7. Despite these difficulties, factory prices are generally unchanged for bullocks, heifers and cows. However, young bulls are proving difficult to get killed. Bullocks are on a base of €3.75/kg, with heifers on €3.85/kg, and R grade cows on €3.00/kg. Quotes for P grade cows range from €2.40/kg to €2.60/kg, with up to €2.80/kg being paid for O grades. Supermarket While prices are unchanged for young bulls, with R grades on €3.75/kg, farmers are finding it difficult to get stock killed. Finishers are being forced to do deals for mixes of bulls with bullocks and heifers to get stock away. Meanwhile, supermarket specification demands have decimated the trade in live cattle to Northern Ireland, with exports down almost 90pc from their peak in 2010. 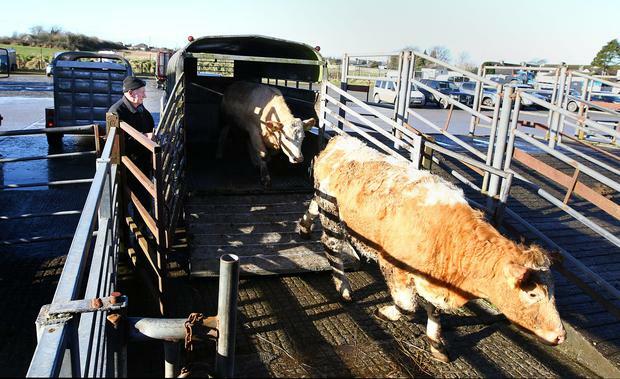 According to latest figures from the Livestock and Meat Commission (LMC) in Northern Ireland, during November 2018 there were 440 male store cattle imported from the South for further finishing on Northern farms, which takes the total for the year to date to 2,696 head. This is a reduction from the 3,248 head imported during the corresponding period in 2017 and represents a 17pc reduction year on year. The LMC figures show that the level of trade for breeding and production has declined steadily over the last number of years from a record 25,115 male cattle imported during the first 11 months of 2010. The fall-off in Northern imports from the South is linked to difficulties around country-of-origin labelling, with stock bred in one jurisdiction and finished in another referred to as ‘nomad cattle’.